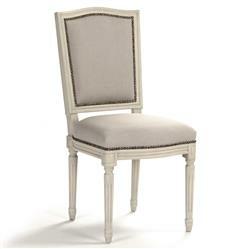 Down home country detailing meets regal European design in these Benoit dining side chairs. Natural linen and burlap envelope the seat’s front and back while ivory wood and nail head studding complete the look. Place these around a dining table or marble kitchen island in your French cottage home. Item sold as a pair.